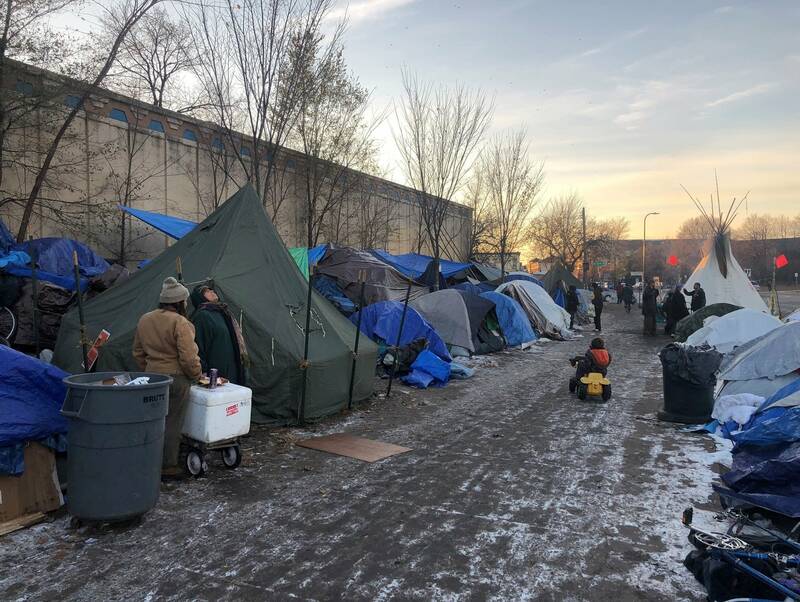 Heated army tents are going up in Minneapolis at the site of a long-standing homeless encampment. 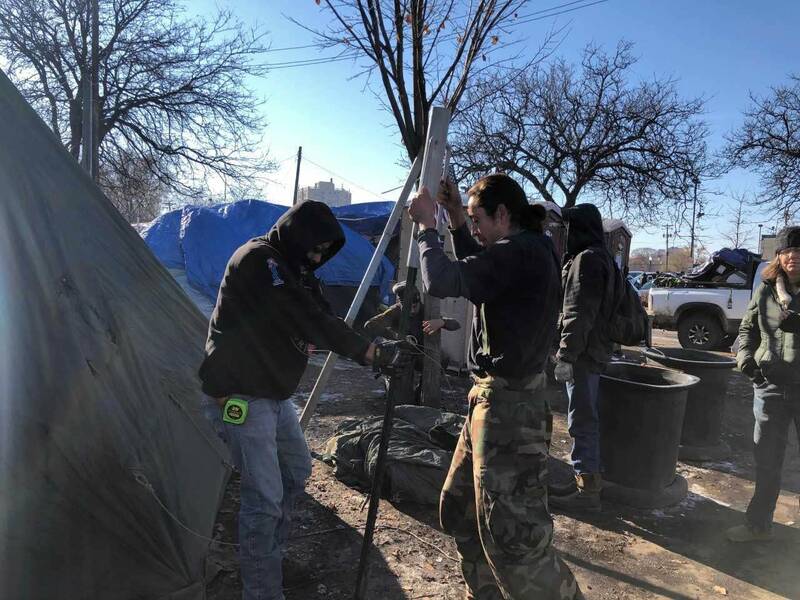 Hundreds of mostly Native American people have been camped out along Franklin and Hiawatha Avenues for months, as officials and advocates look for ways to help people there cope with the onset of winter. Two tents have been erected and a third will go up when space is cleared. They will be heated by stoves and provide a place for people at the camp to warm up. The city of Minneapolis is building a temporary emergency shelter to house about 120 people near the encampment on land owned by the Red Lake Nation. But that won't be ready for another month, and temperatures have been well below freezing in recent days. City leaders, who had previously been reluctant to allow larger structures on the site, decided to change course because of the colder weather. "The Metropolitan Urban Indian Directors asked us if they could put warming huts up. And we have agreed that warmth in this moment is a need. We've asked them to work with our fire chief to make sure that [it] is also safe. Public safety is a big concern," said Nuria Rivera-Vandermyde, Minneapolis city coordinator. The city was previously reluctant to allow substantial investment at the current site because they still want to encourage people to seek traditional shelter, Rivera-Vandermyde says. That's an unpopular option among people at the encampment who say shelters don't feel safe, are too restrictive or require them to leave behind pets or loved-ones. The Minnesota Indian Women's Resource Center purchased two of the army tents. Each can hold about 10 people. A third tent was donated by protesters who are camped out in northern Minnesota opposing the Line 3 oil pipeline project that is wending its way through the regulatory process. Tara Houska, a Line 3 protester, says they drove three hours south from there protest site to help winterize the Minneapolis encampment. "We wanted to share resources and solidarity with the folks down here that are struggling, our indigenous people who are homeless on indigenous lands, and remind people that we are still here and are in solidarity with each other," Houska said. The cold temperatures have made the situation at the encampment even more precarious. One resident was taken to the hospital with what appeared to be frostbite on his feet. Many residents have turned to building small fires near their tents or using personal propane heaters. But those can be dangerous, too. At least one resident has been hospitalized for severe burns. City officials hope everyone at the camp will move away in mid-December when they open the emergency shelter, called a navigation center. It will be a low-barrier alternative to shelter, without curfews and minimal rules, Rivera-Vandermyde said. "Which means if you come in high, or you come in drunk, you will be accepted. We will not allow use to happen at the site, but if you are struggling with addiction, you will not be turned away, and we'll continue to help figure out what that looks like, including medication-assisted treatment if necessary," Rivera-Vandermyde said. No children will be allowed, but couples, groups, and people with pets will be allowed to stay together. The center will have health care services including Native healers and other culturally specific services. As of Wednesday, it's unclear how many people are still living at the encampment. Many people have found housing or chosen to go into shelter, and outreach workers don't believe any more children are in the encampment. As of Wednesday, 160 tents were spread out along the narrow strip of land next to the freeway and Franklin Ave.
A non-profit organization will run the navigation center, but no contract has been officially announced.